The difference between a muffin and a cupcake can be hard to define. Oftentimes it's just about whether there is a frosting piled on top. This Poppy Seed Muffin is more like a pound cake with its rich flavor and its moist, dense texture. I love how the black poppy seeds dot the batter and because lemon goes so well with poppy seeds, I added some tangy lemon zest to the batter and we also brush the hot muffins with a lemon glaze. The first step before you make the batter for these Poppy Seed Muffins is to soak the poppy seeds in either hot water or hot milk. We do this step because poppy seeds have a hard outer shell which can be hard to digest if you don't soak them for at least 30 minutes or up to overnight. As a side note, poppy seeds are the tiny ripe black seeds of the opium poppy plant and while their flavor is said to be nutty, it is barely recognizable because they are so small. Rather, what you notice is how pretty they look dotting the batter. It is hard to imagine that it takes 900,000 of these tiny kidney-shaped seeds to equal one pound (450 grams). 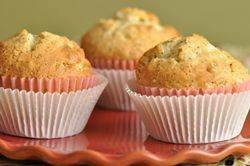 What I also like about these Poppy Seed Muffins is their tangy citrus flavor which comes from adding lemon zest to the batter and we also brush the tops of the hot baked muffins with a lemon glaze. Lemon zest is the outer yellow skin of the lemon and it is where most of the fruit's flavor and perfume are found. Try to use organic lemons and make sure to thoroughly wash the lemon before removing its' skin. Poppy Seed Muffins: Preheat your oven to 350 degrees F (180 degrees C) and place the oven rack in the center of the oven. You can either line a 12 cup muffin pan with paper liners or else lightly butter or spray each muffin cup with a non stick vegetable spray. At least 30 minutes (or up to overnight) before making the batter, stir the poppy seeds into 1/4 cup (60 ml) hot water (this step softens the poppy seeds so they are more digestible). Let sit at room temperature. Then strain. In a bowl, whisk or sift the flour with the baking powder, baking soda, and salt. In the bowl of your electric stand mixer, fitted with the paddle attachment, or with a hand mixer, beat the butter and sugar until light and fluffy (3 - 5 minutes). Beat in the eggs, one at a time, beating well after each addition. Scrape down the sides and bottom of the bowl as needed. Beat in the poppy seeds, yogurt (or sour cream), and vanilla extract until well blended. Add the flour mixture and beat just until moistened. Do not over mix. Spoon the batter into the muffin cups using two spoons or an ice cream scoop (about 1/3 cup (80 ml) (80 grams) in each muffin cup). Bake for about 18-20 minutes or until a toothpick inserted in the center of a muffin comes out clean. Remove from oven and place on a wire rack. Immediately brush the top of each muffin with the hot lemon glaze.